People usually refer to Prague’s history dating back to the 9th century, but it has been a city of note for much longer than that: the capital of Bohemia since 1300 BC and an influential city during the reign of Augustus Caesar. 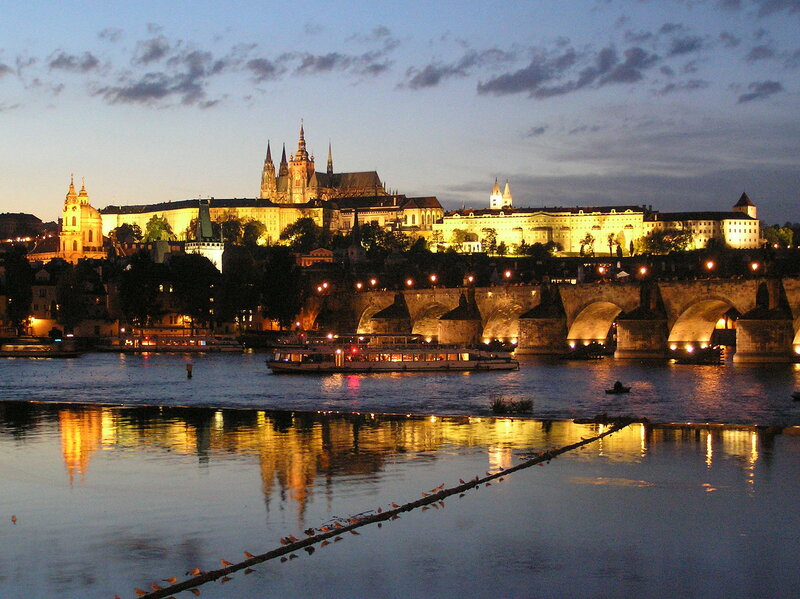 But Prague really flourished during the 14th century reign of Charles IV. As King of Bohemia and the Holy Roman Emperor, he transformed Prague into an imperial capital and the third largest city in Europe (after Rome and Constantinople). Charles did many great things (more on that later), but his son, King Wenceslaus IV, was not nearly so good for the city. Under his rule, almost the entire Jewish population died under orders of the city clergy, who burnt the Jewish quarter to the ground. Prague survived this dark period, however, to became the capital of European culture under King Rudolf II, whose court was full of artists, scientists, musicians, astrologers and magicians. A little more history and then I’m done, honest…. As we know, World War I ended with the defeat of the Austro-Hungarian Empire and the creation of Czechoslovakia. But this new country would not survive the century. The Velvet Revolution in 1989 put an end to communist rule and created a parliamentary republic, and then in 1993, after the split from Slovakia, Prague became the capital of the new Czech Republic. Which brings us to present day (well, 2007 actually), when an intrepid traveller (yours truly) visited this glorious city on what has become widely known as a “mini-break”. Now, I need to make clear right away that this entry will – unusually – dispense with lengthy descriptions of food and omit rave reviews of restaurants… I know, I know you’re disappointed. 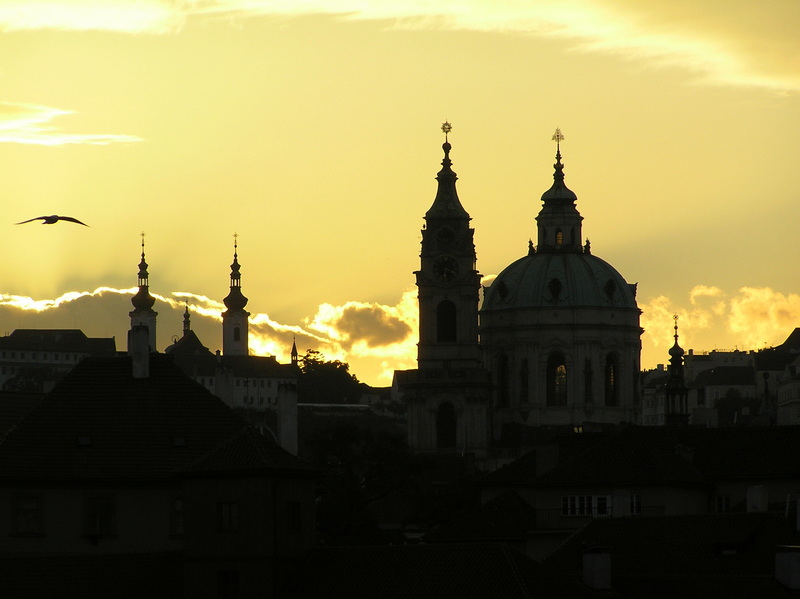 As great as Prague was – in so many ways – my meals were, truthfully, uniformly bad. Ok, I retract that already; I’ve just remembered the amazing patisserie. And the hotdogs. But otherwise, I’m afraid I was not a fan of the dumplings and soups and failed to sample a guláš or stuffed palačinky from which I could accurately determine the meat. So I would not recommend the city as a great gastronomic destination. However, please do visit for the wonderful sights. The city sits astride the Vltava River, with the Hradčany district (castle area) on one side and Staré Město (Old Town) on the other. Spanning the water is the majestic Charles Bridge. Charles IV personally laid the first foundation stone for this bridge and we know this was on the 9th of July 1357 at 5:31 because the palindromic number 135797531 is carved into the bridge tower, the royal astrologists and numerologists having determined this to be the best time to start construction. Whilst we’re talking about Charles, the king also founded the city’s university, now the oldest standing in Central Europe, and the impressive St. Vitus Cathedral. The cathedral stands in one of the many courtyards of the castle, perched on a hill overlooking the city. Interesting factoid: the Guinness Book of Records lists Prague Castle as the largest ancient castle in the world, occupying as it does almost seventy thousand square metres. The vast rampart contains elements of practically every architectural style of the last millennium: it started life as a Romanesque palace, before morphing into a Gothic fortress; and after being damaged almost entirely by fire in the 16th century, it was reconstructed with new renaissance buildings under the Habsburgs, before finally undergoing renovation in the 20th century in order to become the seat of government for the new republic. Try to time your visit with the changing of the guard at the entrance gates, before wandering around the different museums and ecclesiastical buildings to your heart’s content. All that said, and as dramatic as the castle inarguably is, I personally preferred spending time in Staré Město, with its remarkable Old Town Square. The plaza contains the Church of Our Lady before Tyn and the City Hall with its beautiful astronomical clock. Large crowds gather to witness the hourly “Walk of the Apostles”, a parade of Jesus’ companions, a skeletal death figure and other sculptures striking the clock. Installed in 1410, it is the oldest astronomical clock still working. This part of town is also home to the Old-New Synagogue and Jewish Cemetery. I’m not usually a fan of visiting cemeteries (with some notable exceptions: Glasgow’s Necropolis, for instance, and Nunhead’s cemetery in South East London), but this is worth a visit. Over ten thousand gravestones with carefully chiselled Hebrew script protrude haphazardly from the earth. 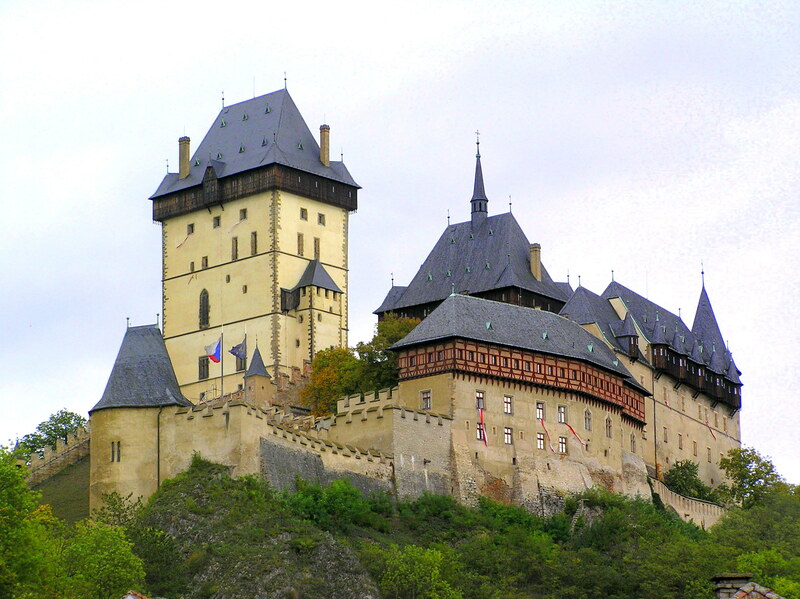 Whilst visiting the city, you won’t regret the 45-minute trip out to Hrad Karlstejn. The 14th century castle was originally built as a treasury to hold the crown jewels and relics of the Holy Roman Empire. It was initiated by Charles IV (him again!) and, as with Prague castle, is an eclectic mix of styles, ranging through the different Gothic periods (high, late and neo), renaissance and beyond. You can take a guided tour of the Imperial Palace, Hall of Knights, Chapel of St. Nicholas, the Royal Bedroom, and Audience Hall. But to be honest, the interior isn’t all that impressive, it’s the exterior – enjoyed best on the winding path through the kitsch German market – that people come to see. So, my visit to Prague taught me two things: 1) I can enjoy a holiday without being pre-occupied by thinking of where to go for my next meal; and 2) I don’t always need to be surrounded by my favoured and more exotic Mediterranean and Moorish architectural styles to feel that I’m on holiday. This entry was posted in Travel and tagged Charles Bridge, Czech Republic, Karlstejn, Prague, Vltava River on March 4, 2014 by victoriassecretblog.